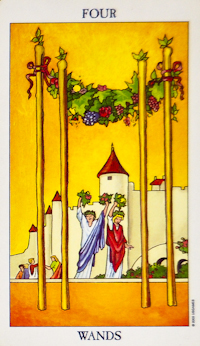 In the Four of Wands, a couple dances beneath a welcome wreath, tied between four crystal tipped wands. The canopy of flowers on the four wands is also similar to the wedding canopy or chuppah of the traditional Jewish ceremony and thus represents a time of fulfillment and satisfaction at the attainment of a goal. In the background stand another group of people, just in front of a large castle, also decorated in flowers. It appears as if a celebration is being held, perhaps as a homecoming or a celebration from within the castle. This card is a card about rites of passage, a warm and supportive home environment. And family gatherings Reversed this card suggests there is a lack of harmony or a breakdown in communication in your family or home. There may be tension between family members or loved ones and you are finding yourself getting caught up in other people’s concerns and relationship problems. This may leave you feeling uncertain about your own relationships and what you can and cannot depend on. You may also be going through a period of transition in your family and home life and feeling some tension as a result. Similarly, you may find your home situation becomes increasingly unstable. There may be an external threat to the peace and happiness you once had in your home. You may be placed into a temporary situation which appeases your immediate concerns but does not yet solve the longer-term issues. Depending on your living arrangements, it may be better to move home for the time being to allow things to settle. There may be delays and setbacks in planning a party or celebration. Someone may get so caught up in the celebration that they lose sight of the purpose. For example wedding preparations may become so stressful that the bride and groom endlessly quarrel and disagree. Someone may lack gratitude for their family and the time spent together. Such as during holiday celebrations. It could be that the housework involved in having a family over is seems endless and that that there is not enough time to enjoy the companion of loved ones. It could be that someone is excessively focused on the environment such as when someone is endlessly rearranging their home office in order to procrastinate getting started on their projects. Given the upright Four of Wands reflects stability, the reversal of this card can indicate that you are going through a period of transition where there is little stability and security. You may be experiencing multiple changes in your life, such as changing jobs, moving house and/or leaving a relationship. While you know that this is an important transition that you need to make, it can be quite unsettling, leaving you feeling out of balance and uncertain about your future. It could also indicate and internal rite of passage of celebration. Someone may not be sharing their victory with others, but privately are proud of a change within themselves. Merry Meet! Merry Part! and Merry Meet Again!